This ambitiously named hill lies west of Slieve Carr. 'Alp' means a lump or protuberance and has the same origin as the Alps of Central Europe according to P.W. Joyce. There is a cairn at the summit. The link with the Alps goes further, even if it is a only link of the imagination: a stirring tale recounted by Geoffrey Keating in his Foras Feasa ar Éirinn (History of Ireland, ca. 1634) and also by Duald Mac Firbis in the Genealogies, Tribes and Cusoms of Hy-Fiachrach (1650) tells of the voyage to the continent of King Dathi of Connacht, the last pagan king of Ireland, in order to avenge the death of Niall of the Nine Hostages. He dies in AD 427 when struck by lightning on Sliabh Ealpa (taken to be the Alps). His army, led by his son Amalgaid, fights a number of battles to bring his body back to Ireland to be buried in the Releg of Cruachan. The places in Europe mentioned in this account were identified by Sir Samuel Ferguson, but Hubert Knox, author of the History of the County of Mayo, rightly doubts its historicity. 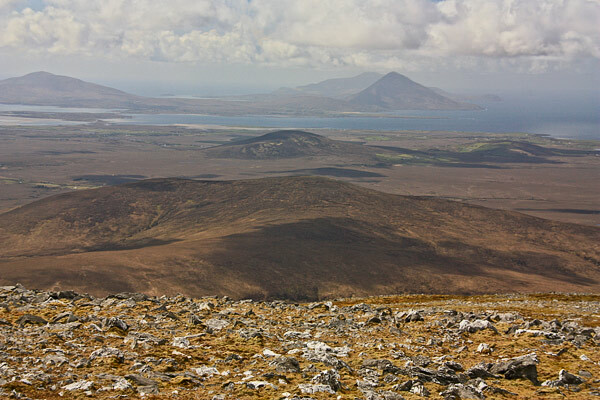 Instead he suggests that Sliabh Ealpa where Dathi died was not the Alps, but rather Slieve Alp near Ballycroy, and that the tale of the invasion of the Roman Empire was an inspired piece of fantasy concocted by somebody unaware of [or deliberately ignoring] the existence of Slieve Alp in Mayo. The association of Dathi with this part of Mayo may be confirmed by the presence of a cairn named Laghtdauhybaun on Slieve Carr and Lough Dahybaun near Bellacorick [Knox, 25-26]. The moral of the story is: make sure you say your prayers if you don't want to be struck by lightning when climbing Slieve Alp! Slieve Alp is the 1095th highest place in Ireland. Picture from group : View of Slieve Alp from Slieve Carr. Picture: View of Slieve Alp from Slieve Carr. Grand title, good views, little challenge. This summit can be reached most easily from the minor road at F85390 15197 A for a round trip of about 2 hours. There is a private bridge here. Ask permission of anyone you see and in particular at the house that the bridge leads to and note that this is a sheep farm so dogs or large parties are most unlikely to be welcome. Reaching the summit is straightforward. See Track 1546. It would also be possible to reach Slieve Alp, which is half in the Ballycroy National Park, from the Bangor Trail starting at either end.